I’m serious. I just go about my business day to day, and the most interesting, if not downright peculiar, things just happen to me. I can’t discern any particular reason for such happenstance. They just do. Yesterday I drove over to Crissy Field while the cleaning people were spiffing up our apartment. The air quality was horrid, but I don’t like being in the apartment while they are cleaning. So, I sat in our little Fiat 500e with the windows up while I watched Netflix. Normally very crowded, you can people watch at Crissy Field, but the air quality was so bad not very many people were out—a few dozen or so. In fact, you could just barely make out the silhouette of the Golden Gate Bridge which is normally a beautiful site from this location. 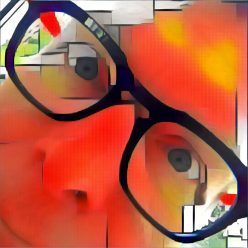 Unexpectedly, a woman came up to my car window and motioned that she wished to speak to me. She was an attractive and very fit woman, perhaps in her 50s or so. (I do not guess the age of women very well.) I lowered my car window. She told me she had a Fiat that was the very same color as ours but hers was the new, larger model, the “X”. I was unaware the 500 was made in a larger size and asked her if hers was also electric. No. She asked if I had seen the commercials for the X. No, I hadn’t. I asked her if she had seen the original commercials for the 500 when they were introduced to the US.1 She had not but wanted to show me the commercial for her car as she busied herself hunting for it on her phone. She found it and asked if I wished to see it. “Sure.” But at this point, things took an unusual twist. She got a little too close (for my comfort level anyway) as she stuck her phone into the car and in my face to play the commercial. As it started to play, she asked if I could see it well. I could and so replied, but she snuggled up closer to my face regardless. I’m including the commercial below. It’s funny, clever, and very creative. However, it was nothing like what I expected. You should watch if before continuing to read my post. “And ready for action…” Well, that was unexpected. When it finished playing, she squealed with delight, asked if I wanted to see it again. “No, but thanks. It was very clever.” I replied. Still a bit too far inside my car window, she gave a brief and somewhat bawdy recap of the commercial and, laughing, said something to the effect that she liked things that got bigger. I don’t actually remember her exact words because I was so caught off guard by what she was implying. Holy cow! This was going downhill much too rapidly. She then missed a beat. She wasn’t expecting my having a husband just as I wasn’t expecting to be hit on by a straight woman at Crissy Field. She then asked if she could take a picture of me inside our tiny bright orange Fiat 500e. She wanted to show her friends back on the east coast, where she is from, the baby brother of her more virile car. We both now have a great story to tell our friends. As a gay man of my years, I do not often have straight women try to pick me up. 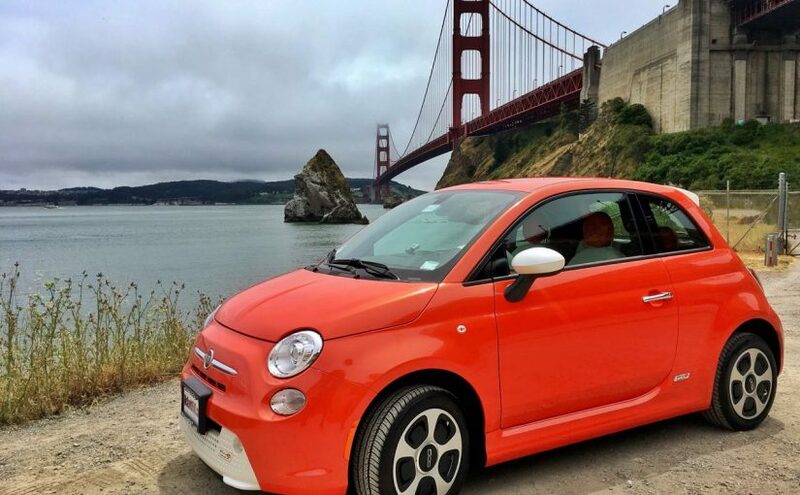 Incidentally, the photo at the top of this post is our Fiat 500e by The Needles near Fort Baker, not at Crissy Field.